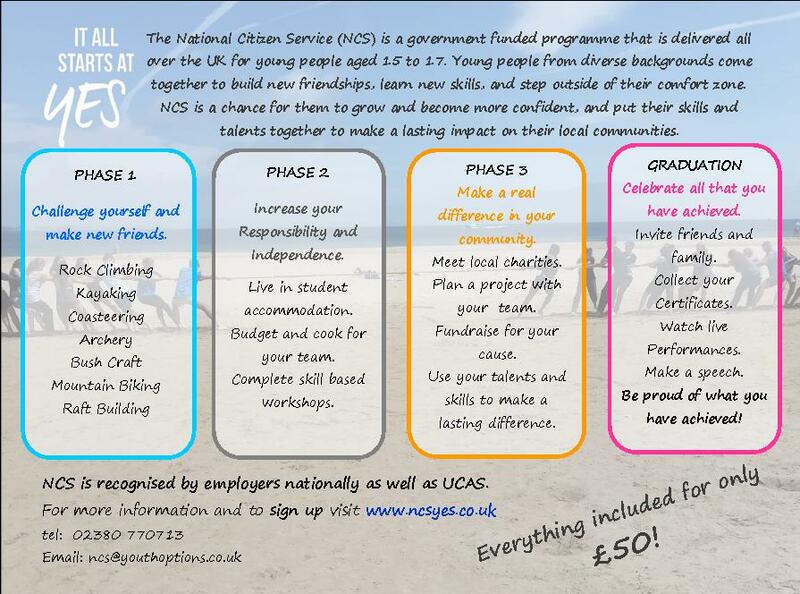 The NCS team have visited every Southampton secondary school since October to promote the National Citizen Service (NCS) summer programme. We have 6 ‘waves’ going out over summer and with just two weeks left until Wave 1 departs, we are still able to accept sign ups who are aged 16-17 and who live in the Southampton City Area. Hayley Pettitt-Miller, NCS Project Manager for Youth Options commented: “There’s just 2 weeks left to go until the start of our summer programme, so any Southampton parents who want to see their young person take part in this once-in-a-lifetime experience should register interest before it’s too late! There are still places available for 15 to 17 years to take part in this once in a lifetime opportunity. To sign up, go to www.ncsyes.co.uk.